One of the most recent home design trends is to include a faux fireplace mantel in your living room, dining room, or even your bedroom. SoCal Fireplace Mantels is your provider for faux fireplace mantels in Los Angeles. A fireplace mantel is the natural focal point of the room, and aside from being an attractive architectural feature, it is a useful place to display your favorite photos, collectibles, and much more. Best of all, you do not need to have a real fireplace to have a fireplace mantel. A faux fireplace mantel can fit on your wall or even around a false fireplace. SoCal Fireplace Mantels is your premiere Los Angeles faux fireplace mantels provider. We offer faux fireplace mantels as well as mantels for real, functional fireplaces. Choose from a variety of materials and styles to compliment the decor and even the color of your room. For a clean, natural look, choose natural stone. No other material tops natural marble, sandstone, travertine, or even granite for classic looks and style. Natural stone lends a subtle depth of color that will compliment any decor. We have a variety of types of natural stone mantels, each with a unique variation in colors and patterns that will turn your faux fireplace or wall into a unique showpiece. If you want a clean, sculpted look, a cast fireplace mantel may be ideal for your needs. Cast fireplace mantels offer a uniform color and a smooth finish that allows the architectural details to stand out. Whether you prefer clean, classic lines or elaborate details, we have a cast fireplace mantel that is ideal for your needs. SoCal Fireplace Mantels strives to be your provider for faux fireplace mantels in Los Angeles. Whatever your design needs, we have a fireplace mantel that will be the envy of all of your friends, or will become a memorable feature of your restaurant, casino, hotel, or business. Trust SoCal Fireplace Mantels, as your Los Angeles faux fireplace mantels provider, to help you select the ideal fireplace mantel for your home or business. Call us today to discuss your design needs with one of our knowledgeable representatives, or stop by our spacious showroom in Van Nuys to view our fireplace mantels, overmantels, and architectural precast products for yourself. 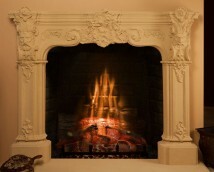 SoCal Fireplace Mantels also offers services for residents of Ventura County and Orange County.